The Colt Python made its debut in 1953 made on the new I frame and built to compete with Smith & Wesson’s Model 27 in .357 Remington Magnum. Those early Smith & Wesson Model 27’s were hand made especially the registered magnums which were registered to the owner. Colt were in the business of making excellent revolvers and were determined to put a revolver on the market that was more than the equal of the Smith & Wesson Model 27. 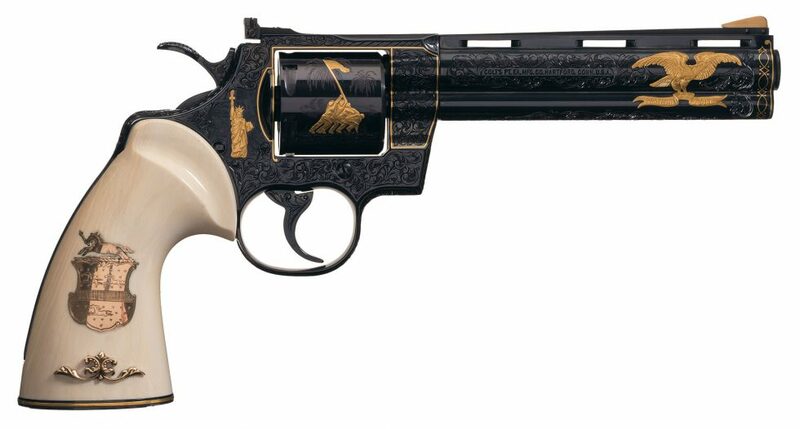 This hand made and engraved Colt Python is one of the most expensively personalized examples one could hope to find. Colt’s Python certainly lived up to expectations and has been described as “the best production revolver ever made” by such notable people as Ian V. Hogg (Author of many firearms books including Military Small Arms of the Twentieth Century), Chuck Hawks, and the late great Jeff Cooper. These were a revolver that was target range ready straight out of the box with a delightful trigger in both single and double action modes. This Colt Python is decorated with patriotic scenes in gold inlay making it a tribute to the history of the United States. Although many commonly assume that the Colt Python was only made in .357 Remington Magnum it was made in very limited numbers in a few other calibers. 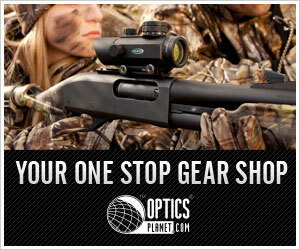 There was a target model made specifically in .38 Special, and also limited production models in .256 Winchester, .41 Remington Magnum, and .44 Special. Examples in such calibers are very unusual and if you are offered one for sale you are cautioned to be aware of potential fakes and to research the credentials of the piece you are being offered before handing over your hard earned currency. 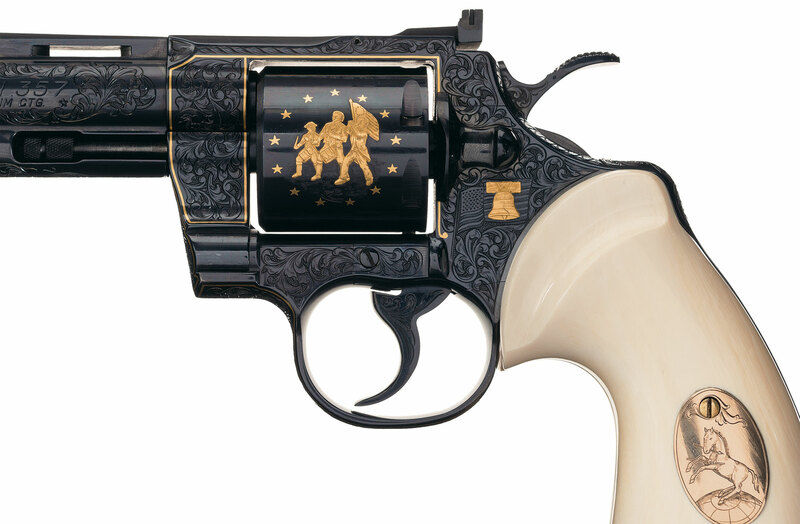 The right side of this Colt Python is gold inlaid with the flag raising at Iwo Jima and the Statue of Liberty. One of the features that made the Colt Python such as desirable revolver was its accuracy which partly resulted from its excellent trigger from the factory, and partly from the mechanism that locked the cylinder just as the hammer was to fall ensuring maximum stability and consistency. 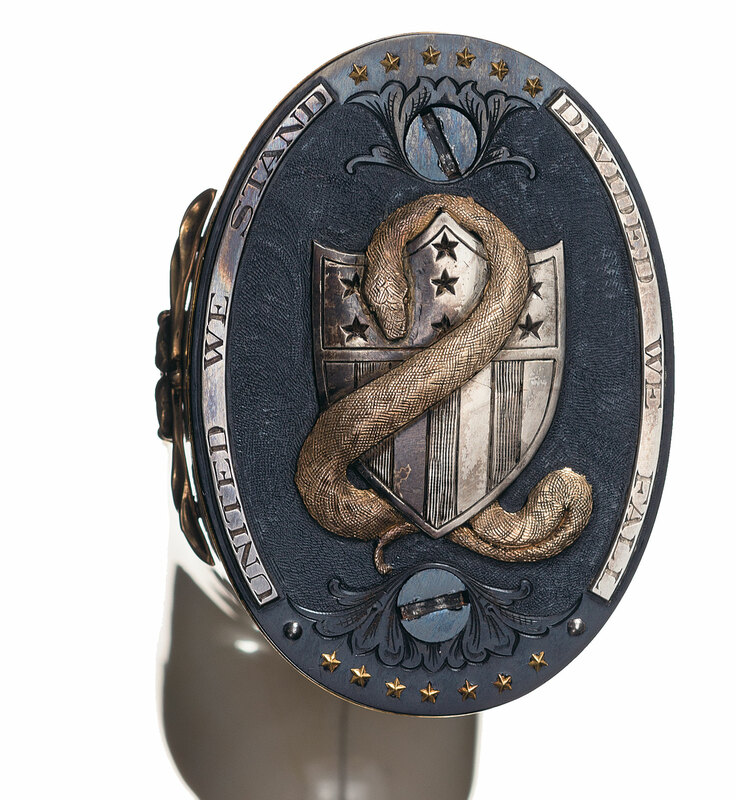 Underside of the grip of this revolver features a United States shield with an intertwined Python. The grip cap also features thirteen stars and the inscription “United We Stand, Divide We Fall”. Something that is very relevant to United States politics at this time especially. 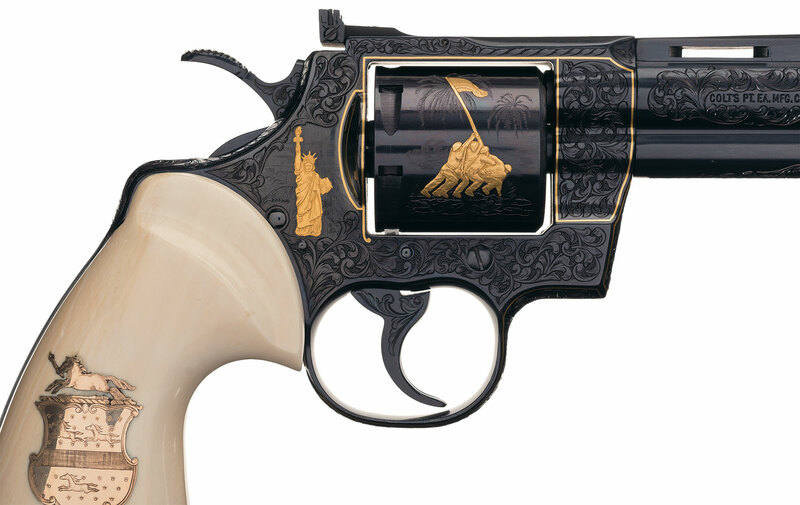 The Colt Python revolver in our pictures is a heavily personalized example decorated in a strongly patriotic theme with inlays depicting the Statue of Liberty, Liberty Bell, Flag raising at Iwo Jima, and “The Spirit of ’76“. On the grips is the Colt shield whilst on the underside of the grip is a US shield intertwined with a python with thirteen stars and the motto “United We Stand, Divided We Fall“: a motto that has been at the forefront for the United States from its revolutionary inception through the Civil War to the present day. The underside of the trigger guard features “Colt” in gold inlay. 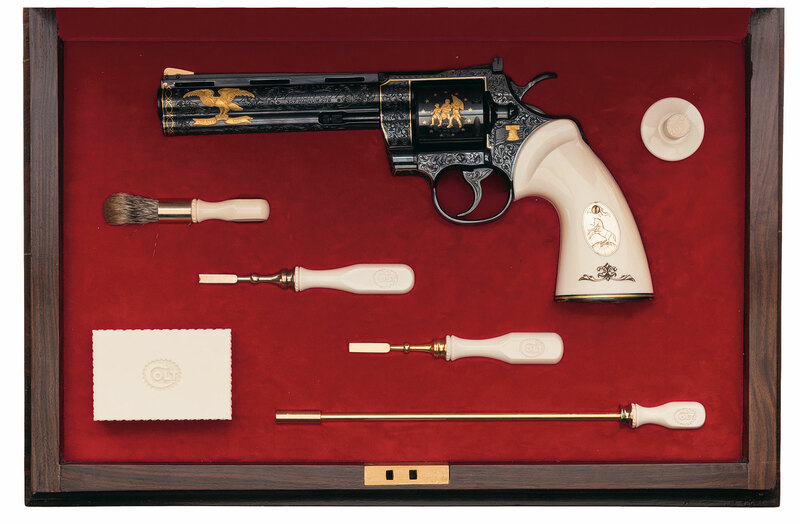 This revolver is signed “HMD” for master engraver Howard Dove (1942-1994) on the left grip frame and the pistol grip cap is signed on the back by Leonard Francolini who did the work on the grips and grip cap. The embellishment work on this revolver was carried out by Art Jewel Enterprises on the order of a customer from California and the revolver comes with a March 4, 1986, letter from Harbans Singh on Art Jewel Enterprises, Ltd. Letterhead confirming the authenticity of the work done. This revolver comes in a presentation case with a matching set of tools. This revolver which featured on the cover of the “2017 Standard Catalog of Firearms” edited by Jerry Lee with description on page 13 is coming up for sale by Rock Island Auction on September 9th, 2017. 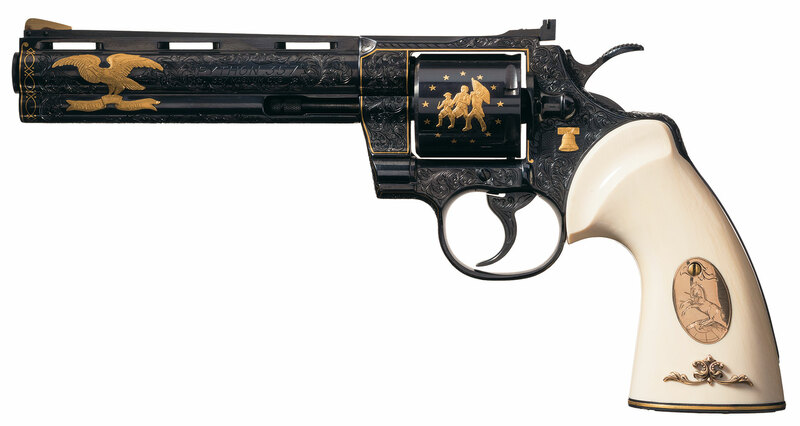 This revolver is expected to sell in the range USD$35,000-$55,000. 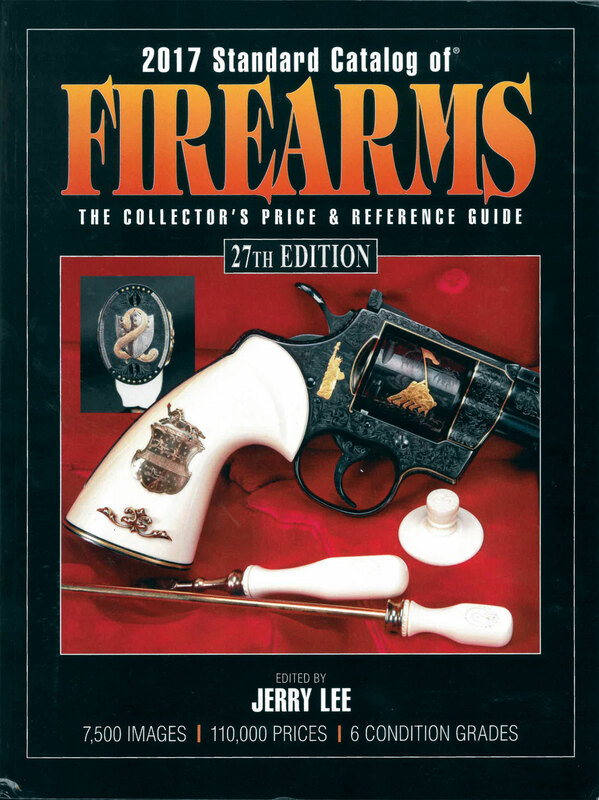 There are a number of Colt Python revolvers coming up for sale at this auction which you can view if you click here. The Colt Python was certainly one of the greatest production revolvers ever made and this revolver is not only one of the most beautiful examples but it is in a patriotic theme that is as relevant today as it was when it was made three decades ago.